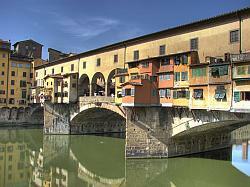 Rome, Tuscany, Florence: three of Italy’s most popular destinations combined for one amazing holiday. Start your vacation in Rome, and spend four days among the ancient ruins. You then travel by rail to Florence where you will pick up your car rental and make your way to the rolling hills of Tuscany. You will have three days to explore the region full of sunflowers. Then drive yourself back to Florence you will return car and explore the many museums and galleries housing famous art in this renowned city. As always, it has been a challenge, a dramatic adventure. Now it’s finally over, the race against the clock right up to the last minute. Another guide, another region, with the same reasons for existence, the same desire to recount, to amaze and delight, and the increased awareness of discovering a country which is always different and always true to itself. Tuscany is no exception. The common denominator leads us page after page in the discovery of a reality which is already a myth, of a land which is already a dream. This is love at first sight, and the desire to live it to the full. It’s consuming nostalgia and genuine wonder, or else it’s indifference. There are no half measures, no clichés. It’s all here, concealed in stones which whisper their history: cities, towns, castles, and cathedrals, palazzi and bridges. Everything is art, everything is unique, vast genius. Maybe it’s a generic inheritance, or more simply a “modus vivendi”. You can perceive it, but not describe it. Just try, for example, to summarise in a few clear concepts Roberto Benigni’s extraordinary, awkward form of communication. This is Tuscanness. And so are the colours of Chianti, – whether we’re speaking of the wine or the countryside – the genius of Leonardo and the Florentine beefsteak. The rest is history. Rivers of ink have flowed – the Arno doesn’t need them – in attempts to say what has already been said, already written. The truth is that we didn’t discover Tuscany. But we have tried to re-perceive and interpret it, each bringing to the task his or her own cultural baggage and experience of life. We have all contributed to make it different and we would have liked to do more, but a guide by definition remains only a first step towards knowledge. We only hope that it will prove a useful companion along the way. To transmit what is perhaps most aptly encompassed by the term “Tuscanness” is frankly no easy task.